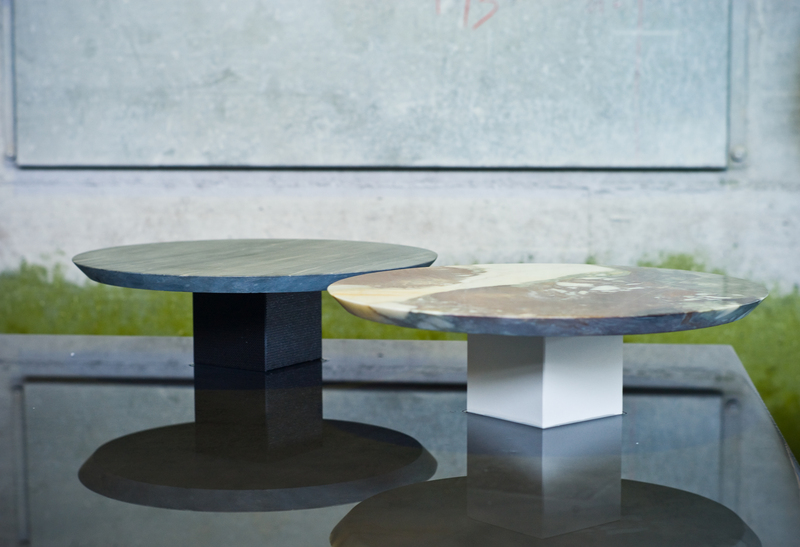 These striking coffee tables combines a modern design with the use of precious marbles traditionally used by the Medici family during the Florentine Ranaissance. Versatile and minimalist, these piecse will make a statement in any decor. Using the finest marbles like Portoro marble, Calacatta marble , Bleu Turquin marble and Breccia Medicea marble, Paira merges tradition and innovation producing timeless objects with a minimalist and geometric design. This table lamp is inspired by the materials used during the Renaissance by the Medici family in Florence. 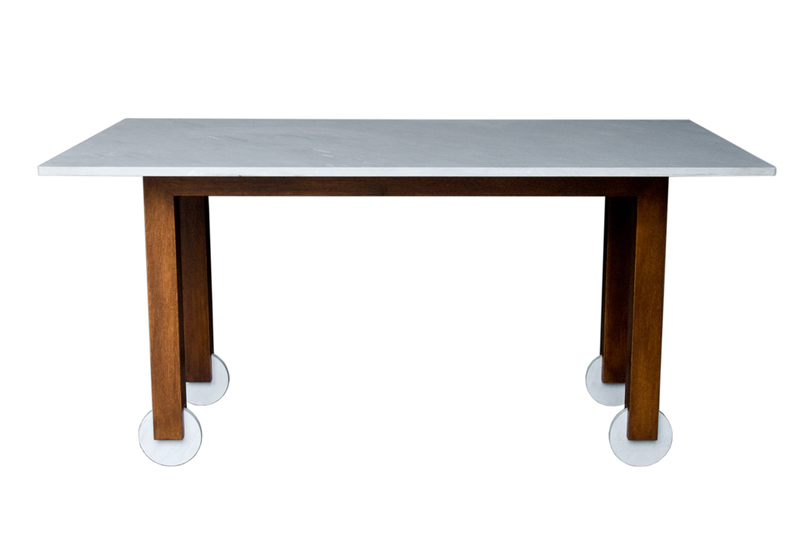 The minimalist style of its geometric silhouette is combined with the Portoro marble to create a timeless object that can be used in an entryway, living room, or study to add an accent of refined elegance. The base is a cube of black Portoro and supports a light bulb (5W LED, included) with its half top covered in a golden finish to guarantee a diffused, indirect light. The lamp is available in other materials and colors. Please ask the concierge. This striking dining table combines a contemporary and minimalist design with the use of noble materials to create a timeless object of functional decor. The structure, in durmast oak painted in a rich shade of brown, supports a rectangular top in Bleu Turquin marble, which gained popularity during the Medieval times and Renaissance in Florence for the construction of buildings, churches and fountains. The piece is highlighted at the base with fixed Bleu Turquin disks that add the illusion of movement. Writing deask made in Bleu Turquin Marble. This sumptuous centerpiece is inspired by the Medici family’s collections of fine marble objects made during the Renaissance in Florence, in particular several furniture pieces featuring, like in this case, Breccia Medicea marble or Bleu Turquin marble. The ceramics cubic base supports a flared top made of this precious marble whose natural veins make each piece a one-of-a-kind object. This striking piece can be used on the table to serve small food or fruit, or in an entryway or living room to display heirlooms or support candles. Minimalist and sophisticated, this exquisite centerpiece will complement any decor, thanks to its geometric silhouette and the use of the Portoro marble, a traditional material used by the Medici family during the Florentine Renaissance. The Portoro is used for the base, on which rests a thin layer of new ceramic whose finish evokes the texture of silk and gives a precious, unique accent to the piece. Ideal to support candles or small decorative objects, this piece features a bold design that will make a statement in any room of the house. This exquisite centerpiece features a unique design that will enhance the look of any room, such as a dining room, to serve finger food or fruit, or a living room or entryway, to display small objects. The central glossy Portoro marble sphere rests on a round wooden base with a glossy black finish, covered with a layer of new ceramics, which is scratch- and heat-resistant. The striking finish of the ceramic evokes the texture of sumptuous fabrics and adds a refined accent to this piece that will be suited for any decor.